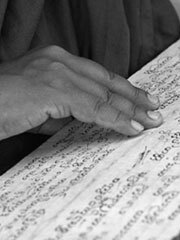 The Sutta Pitaka (or Sutra Pitaka) is the second of three divisions of the Tipitaka, the great Pali collection of Buddhist writings. The Sutta Pitaka contains more than 10,000 suttas (teachings) attributed to the Buddha or his close companions. Digha Nikaya, the «long» discourses. These include The Greater Discourse on the Foundations of Mindfulness, The Fruits of the Contemplative Life, and The Buddha’s Last Days. There are 34 long suttas in this nikaya. Majjhima Nikaya, the «medium-length» discourses. These include Shorter Exposition of Kamma, Mindfulness of Breathing, and Mindfulness of the Body. There are 152 medium-length suttas in this nikaya. Samyutta Nikaya, the «clustered» discourses. There are 2,889 shorter suttas clustered together by subject. Anguttara Nikaya, the «gradual collection». These teachings are arranged for mnemonic purposes. It includes 9,557 very short sutras grouped by number. Khuddaka Nikaya, the «minor collection». This is a heterogeneous mix of sermons, doctrines, and poetry attributed to the Buddha and his disciples. The well-known Dhammapada is in this section.